I love anything with pumpkin as a main ingredient, it always plays nice with other flavors in a recipe. With all the cold and blustery days we have had here in Oregon, soup has most definitely been on my mind. Today those thoughts of a warm dinner served with buttery, crusty bread came to fruition. This meal turned out amazing, even my husband, who is not necessarily ecstatic when it comes to eating a vegetarian dish, he usually wants some kind of meat, was very happy with the end result. In fact he loved it. The soup was very thick and hearty with a tangy taste brought on the addition of balsamic vinegar. Overall it was an A+ as far as taste goes. The soup is also very easy to make, another plus in my book with the busy schedule I have been keeping lately. If soup is in your near future give this one a try, I think you’ll enjoy it. In a large pot sauté red onion, garlic, cumin, kosher salt, cinnamon, allspice and pepper in oil on low-medium heat until red onion and garlic are brown; about 3 minutes. 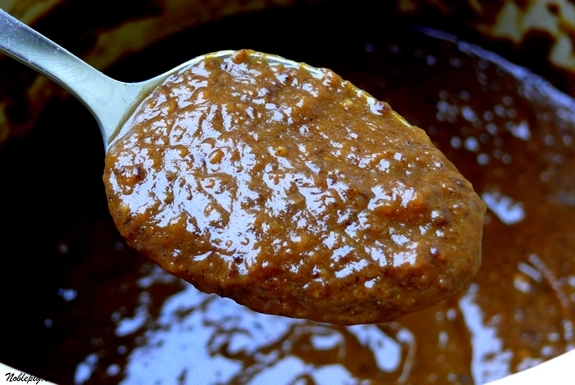 In a food processor or blender puree the beans and tomatoes with half of the vegetable broth. Add pureed ingredients, pumpkin and the rest of the broth to the pot. Simmer uncovered until thick, stirring often and scraping the bottom, about 40-45 minutes. Before serving stir in balsamic vinegar. Garnish with baked pumpkin seeds. We also added a dollop of sour cream. If you like heat, add some cayenne while the soup is simmering. Simmer uncovered until thick, stirring often and scraping the bottom, about 40-45 minutes. Before serving stir in balsamic vinegar. Garnish with baked pumpkin seeds. We also added a dollop of sour cream. If you like heat, add some cayenne while the soup is simmering. What an interesting combination Cathy. Looks delicious. This soup is so comforting and packed full of flavour Cathy. If it weren’t 4:10 AM I would thing of having a bowl. i claim to not like pumpkin, and i’ll still stand by that. however, i’m quite certain i would love this soup. black beans rule, and that little touch of allspice would be great! happy halloween, cathy! Looks delicious! And the black-orange combo seems very Halloween-esque. I just love the seasonings in this soup, but I would like to try it without pureeing the beans and tomatoes. Do you think it will be just as tasty? What a great quick Halloween evening dinner it will be. Happy Halloween to you! Thanks for the great recipes and interesting topics regarding the winery and your new lifestyle. Mmmm, mm, mmm! Soup is good food. You have a great day with those boys, I’m sure they are just as excited as mine! 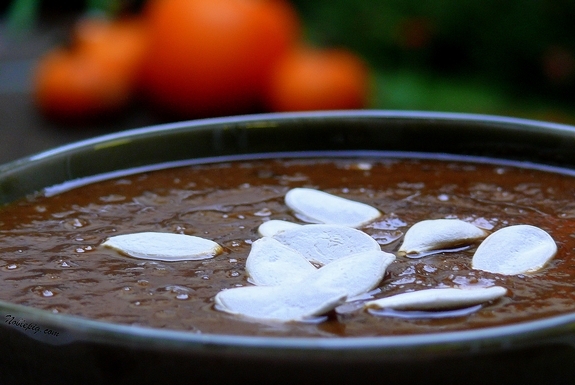 The combination of pumpkin and black beans never occurred to me, but this sounds yummy! Especially on a very blustery Halloween night like we’re slated to have! Winds in excess of 40mph with wispy clouds passing o’er the moon…deliciously spooky! This sounds amazing with the black beans and pumpkin, very nice!! I’ve been thinking pumpkin and chili a lot lately, and this combines the two thoughts perfectly! 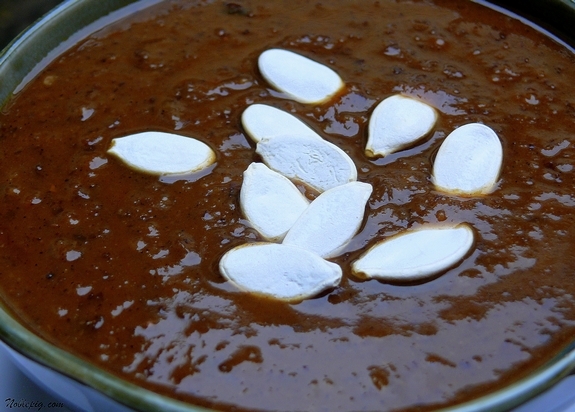 I love the use of pumpkin in a black bean soup. I will have to make this soon! Wow Cathy. This must be dinner tomorrow! Thank-you! This is a lovely Fall soup, love the spices in here too, very nice with the pumpkin seed garnish too! This sounds most delicious, perfect for the season. An insane and safe night, that is just what Ive planned..
OMG, I am definitely making this soup tomorrow! Happy Halloween! Your soup looks so delicious that I can’t wait to try it. Hope the boys have a great time tonight! Wow, what a great combo here, love the beans and pumpkin and spices! Magic in a bowl, perfect for Halloween! 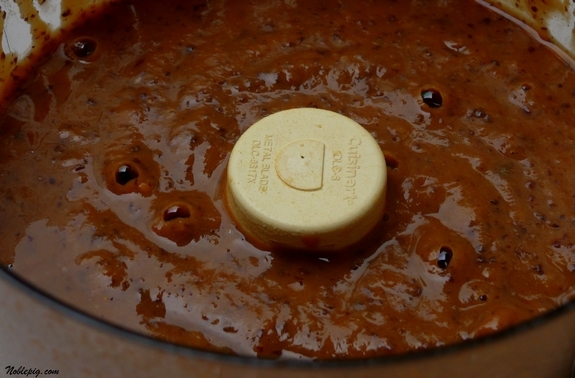 The balsamic vinegar is a great idea to freshen the taste of the beans. Thanks! Any soup involving black beans gets the thumbs up from me – add the tang of balsamic and all of that other good stuff and it’s got to be a winner. Does that ever look like a fantastic soup! Black beans and pumpkin are a great combination, along with all the spices you’ve used. Making this one for sure. What is it with men and meat–my husband is the same way…a meal just isn’t a meal without meat. I’m going to slip this soup by; it looks fantastic! I want this now, which means I have to make it. This soup is wonderful! It has a spot in a drawer with my favorite recipes now. Thank-you! Wow cinnamon, allspice, and cumin, this soups sounds so flavorful. 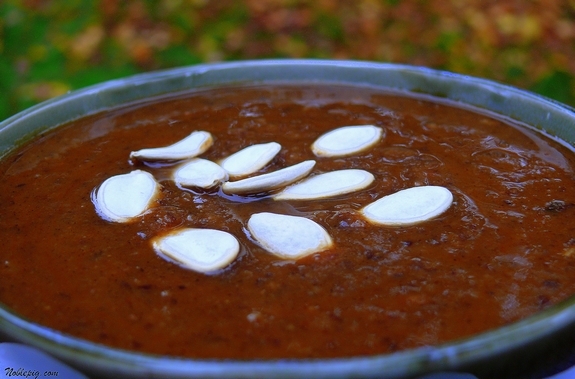 I do love those flavors and the combination of the black beans and pumpkin sound delish! This was delicious! We enjoyed it with homemade cornbread. I made it the day before and let it sit overnight and reheated it. Yum. This may be my new favorite soup on the planet. Seriously… you rule! I would have never put these two flavors together, but it sounds awesome! !